Macro Musings Blog: Is Weak Aggregate Demand Really the Main Problem? The main reason U.S. companies are reluctant to step up hiring is scant demand, rather than uncertainty over government policies, according to a majority of economists in a new Wall Street Journal survey...In the survey, conducted July 8-13 and released Monday, 53 economists—not all of whom answer every question—were asked the main reason employers aren't hiring more readily. Of the 51 who responded to the question, 31 cited lack of demand (65%) and 14 (27%) cited uncertainty about government policy. The others said hiring overseas was more appealing. This conclusion is supported by the findings in the most recent NFIB's survey of small businesses. 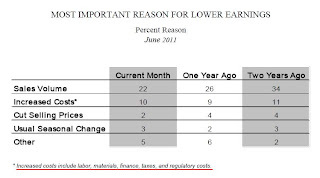 This survey has consistently shown, and shows for June, that the number one problem facing small business is not regulation or taxes--though they do matter according to the survey--but weak sales. 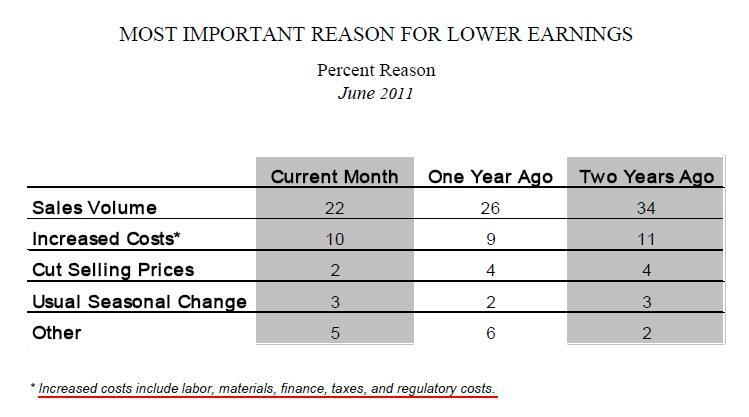 Here is a table, for example, from the June, 2011 survey that underscores that it is weak sales more than anything else that is creating stress for small firms. Note that regulatory costs and taxes are captured under the increased costs category (see underlined footnote). I suspect regulatory costs become more apparent and seem more important when aggregate demand is persistently weak. Conversely, if firms were flush with growing revenues and expected higher sales the regulatory costs would probably seem less burdensome. This is not trivialize the importance of such regulatory costs, but to point out that some commentators should probably spend more time thinking about the problem of weak aggregate demand and what can be done to fix it. [L]ook at the table on page 20 of the report. Once again, only a very small percentage of firms list "quality of labour" as their most important problem. 5% today, compared to 4% one year ago, 3% as the survey low, and 24% as the survey high. The fact that labour is so easy to hire is more confirmation that there's generalised excess supply, and the problem is AD. David: look at the table on page 20 of the report. Once again, only a very small percentage of firms list "quality of labour" as their most important problem. 5% today, compared to 4% one year ago, 3% as the survey low, and 24% as the survey high. The fact that labour is so easy to hire is more confirmation that there's generalised excess supply, and the problem is AD. Great point Nick. I will mention it an update. I was just talking to a lady from a wholesaler to small retailers (e.g. gas stations and grocery stores). She just told the same story: sales are down, not much demand. She said that most businesses she deal with are absorbing losses to avoid layoffs. Everyone tells the same story ... unless they work in healthcare, of course. The next question is why hasn't demand picked back up, and I believe the answer is consumer debt overhang. Household debt stands at 115% of disposable income, off the 2008 130% peak but still 50% above the 1975-2000 average of 75%. To my mind, the implications to policy priorities are: inflation, mortgage modification, and weak dollar (to "import" demand). Nope. That isn't it. Every debtor has a creditor. Debtors reduce consumption to pay back creditor, and what do creditors do? They either increase consumption or continue investing. Only the composition of demand changes, not its aggregate. There is one exception. What if the creditors do not increase consumption or continue investing? What if they just receive the money and hold larger money balances? Unless the money supply increases to offset the increase in demand, aggregate demand will begin falling. Debtors will discover that U.S. Dollars are more scarce, and will find it more difficult to pay off debts. Debts that previously seemed manageable become overwhelming, and it seems as though excessive debts have caused the recession, but it is actually the excess demand for money. Debts may be excessive, and that is not a good thing, but it doesn't cause a major recession -- the excess demand for money does that. There is another potential message in the NFIB survey. The June reading of 90.8 is below the readings of the past two recessions. The NFIB has significantly underperformed its corporate counterpart, the ISM, in this recovery. This helps explain both the anemic jobs recovery and the twelve-month stagnation of Household Survey employment (up only 240k in that time). The NY Fed's recent paper on weak real discretionary services spend contains a possible explanation for the NFIB's weakness. Why is this type of spending lagging in the recovery? Relative performance differentials across sectors in the economy point to strcutural factors at work. They say there is medication for when one gets depressed. But what if you get depressed for a good reason, like current Fed monetary policy and the braying of the gold nuts and tight-money crowd? I got into an argument via Twitter this week with someone at Economics21 over a recent op-ed they wrote that the problem wasn't aggregate demand, it was all government regulation and government crowding-out. They refuse to acknowledge these types of surveys.